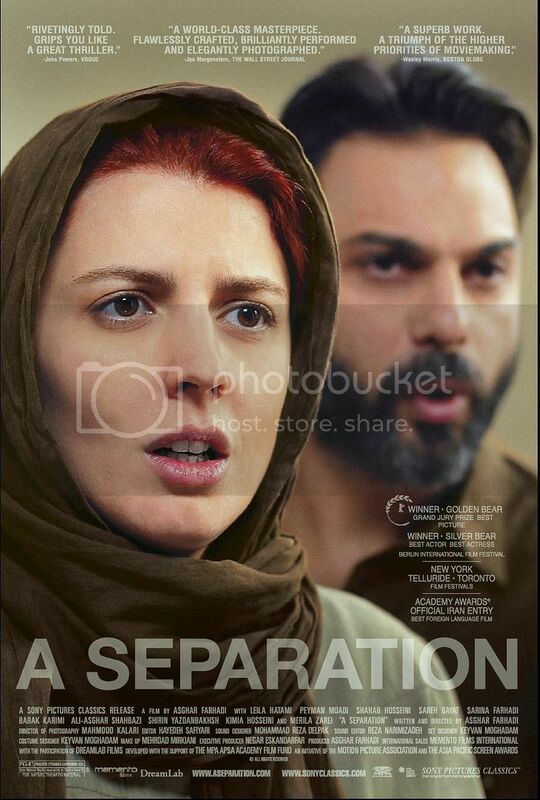 The superb Jodaeiye Nader az Simin (A Separation, جدایی نادر از سیمین‎) is a layered, humanist take on some pretty sad domestic drama. Following two Iranian couples - the intellectual middle-class Nader and Simin, and the struggling working class Razieh and Hojjat - we learn about modern-day Tehran, the difficulties of growing older, your parents disappointing you, and the danger of assumptions. When Simin moves in with her parents, Nader hires a caretaker for his father - the exhausted-looking, chador-wearing Razieh (Sareh Bayat). She arrives with adorable daughter in tow, but immediately there's problems: religious guilt plagues her when she has to take care of Nader's father soiling himself, and she's also anxious not to let her husband know that she's working here. When, one day, Nader comes home to find her and her daughter absent, and his father, unconscious, tied to the bed, things spiral out of control. You've probably already got a bunch of assumptions running through your head, just from the way we mapped out the plot: about patriarchal husbands refusing to leave Iran, of poor, put-upon wives struggling to make ends meet. And so on and so forth. The genius of the film is how subtly and realistically we see our assumptions for what they are: bias and ill-informed prejudice. Like Revolutionary Road, you can deeply sympathize with each character, and you can see that they're essentially good people trying to deal with an increasingly complex, messy situation. The film lightly jabs at those who are a bit too smug in their self-righteousness: Nader being the case in point. He's a calm, measured man with a great relationship with his daughter. Early in the film, we see him insisting that she gas up their car and get the change - teaching her to be independent, even forceful. "Dad, they were all staring," she whispers anxiously. Let them stare, my little emancipated daughter! Indeed, Nader is led by a moral clarity which is at first admirable, but increasingly erodes as the conflict with the other couple gets thornier and thornier. That clarity turns into a high horse. And high horses - they are hard to get down from. Iranian cinema is famously good, and we're embarrassed to be a PPCC who's only seen this Iranian film. Because, gosh, it's good. Gosh, wow. The acting by everyone is top-notch, with perhaps Shahab Hosseini as the greatest revelation. His performance is brutal, tragic, often hard to take in. And it's maybe the most interesting: as he struggles against the stereotypes that threaten to submerge him. "I swear on this Quran, we're human just like you!" he says at one point, and it's scathing. Highly recommended. Maybe a perfect film. And please leave reccs for more Iranian cinema in the comments. Other Iranian films that I will highly recommend are: Children of Heaven, The Colour of Paradise, Baran, The White Balloon... these are the ones I have seen. Actually, go through the entire filmography of Majid Majidi and Jafar Panahi. The latter is the same guy who's been banned by the govt from making movies, and still keeps making them in secret, smuggling his films via pen drives hidden in cakes and such. Brilliant man. Panahi's films are typically verite with a simple premise but tackling very strong subjects. Offside, for example, happens in real time, following a group of girls who somehow get inside a football stadium to watch a match (girls are forbidden from such venues in Iran). Through conversation, it raises questions on such laws and the notions behind them. It's the only Iranian film in which I've seen so much as the back of a woman's neck (the girls are disguised as boys) and that feels like a terrible transgression. Majidi's work is more aesthetic and deals with human relationships and emotions in a very poetic manner. Song of Sparrow contains some of the most enchanting cinematography I've seen.